If you ask Raquel Gomez how she found success in agriculture, she’ll tell you it’s because she decided to be successful. "Life is about choices and what you make of it. I chose to be successful, so I was. Mind over matter,” Gomez said. There was a time when Gomez thought her Central Valley roots would hold her back, that coming from this area somehow hindered her chances at getting into a horticulture graduate program. 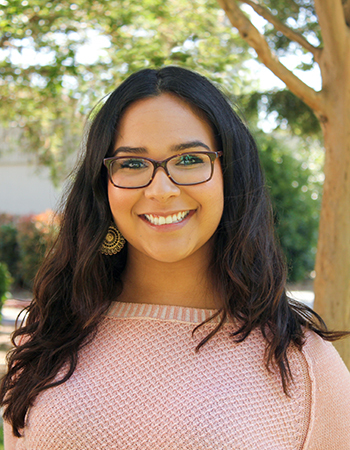 When she started looking at her applications, however, Gomez realized how many meaningful experiences she had at Stan State. During her undergraduate studies, Gomez served as Agriculture Ambassador President, attended a USDA conference trip and completed a UC Extension internship. After receiving her master’s of science in horticulture, Gomez plans to pursue a doctorate and eventually teach horticulture at the collegiate level. And Gomez doesn’t take that Warrior pride lightly, adding that every Stan State grad should show pride in their Turlock roots, and boast about their experiences at the University.